This surveillance photo from a low-level surveillance flight over Remedios on October 25 was one of the first to show one of the four combat regiments in Cuba, including their FROG nuclear-capable battlefield rockets. 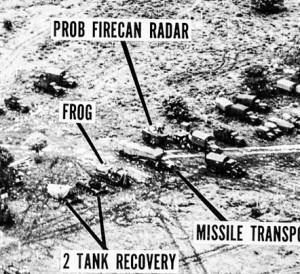 In this November 29, 1962, discussion, Kennedy thinks through the costs and benefits of allowing Soviet combat troops and their sophisticated weaponry, including short-range, nuclear-capable FROG rockets, to stay in Cuba. Having decided that the cost of offering a formal guarantee against invading Cuba was too high a price, Kennedy recognized that they had little in the way of leverage to induce the removal of the Soviet troops. Nevertheless, Kennedy continued through 1963 to push in public forums for the removal of the troops, counting them amongst the “unfinished business” of the Cuban missile crisis. This key decision not to push harder for Khrushchev to remove those forces (which Kennedy refers to as “guard units” since they were not equipped to operate beyond Cuba’s shores) in turn set up the so-called Soviet Brigade Crisis that Jimmy Carter faced in the fall of 1979 when Soviet troops were “discovered” in Cuba. That later controversy in turn contributed to undermining efforts toward detente with the Soviet Union. JFK Isn’t this—our problem– I think one of our problems is that they will not take out those guard units [and] the removal of a lot of these other weapons until they feel they have an iron-clad guarantee against invasion. So that we have to decide whether we’d rather have those units in and not have the guarantee, or the assurance, or . . . because I don’t think we can have it both ways. If we don’t give them the assurance they’re not going to take out those units. There’s really no incentive for them to do it. Dean Rusk Well, we have not made those units a condition for the assurance we’re prepared to offer. McGeorge Bundy They’re not that important. Roswell Gilpatric I wonder if they really are [unclear]. Rusk --there [unclear] question is already [unclear] and the kind of assurance that we could give them at the Security Council really makes a difference to them about leaving those troops in or out. I think those troops probably are there for other purposes. They are not really there just because we have failed to make our existing assurance more formal. JFK Well, they’re in there because it’s part of the whole operation. The question is now whether they take them out if we don’t give that assurance. JFK They’re there because—they’ll take them—what? Rusk [Unclear: Because?] they may not take them out, Mr. President. They want to leave them there anyhow and use that as a reason. But I don’t think that they would leave them there for fear that in the absence of a more formal assurance we’re going to invade the island. I don’t think that would be the real purpose. They’d have other purposes in mind, such as controlling Cuba and . . .
Rusk I would think that [unclear] keep our eye on the point that [John] McCloy made to [Vasily] Kuznetsov: that so long as these troops are there, we’ve got to be suspicious about what else is on the island. JFK Yeah, that’s a pretty good point. John McCone Not only what is on the island but that they might reintroduce at some point bring back in. Anytime they put these things in operation, the SAM sites, the MiG-21s, it probably forecloses anything you can do on it. So far they [unclear] on one occasion when they did bring down a U-2, indicating that they have that capability. Our surveillance plan [unclear] operations. Rusk Mr. President, I should report that Adlai Stevenson now rather suspects this will wind up without a Security Council [unclear]. JFK Well, I agree. As long as they’re there we have this problem. But he—[I] wouldn’t be surprised that he may well say, “Well, they’re going to be there until we get some satisfactory assurance you’re not going to invade Cuba.” Well, anyway, that’s . . .
Bundy I think that would be a bargaining point that we don’t buy. Transcript from David Coleman and Timothy Naftali, eds., The Presidential Recordings: John F. Kennedy, vol. 5 (New York: W.W. Norton, forthcoming 2013).